In 2-quart saucepan, cook noodles to desired doneness as directed on package. Drain; return to saucepan. Cover to keep warm. Meanwhile, in 1-quart saucepan, cook butter and almonds over medium heat for 5 to 8 minutes or until light golden brown, stirring frequently. 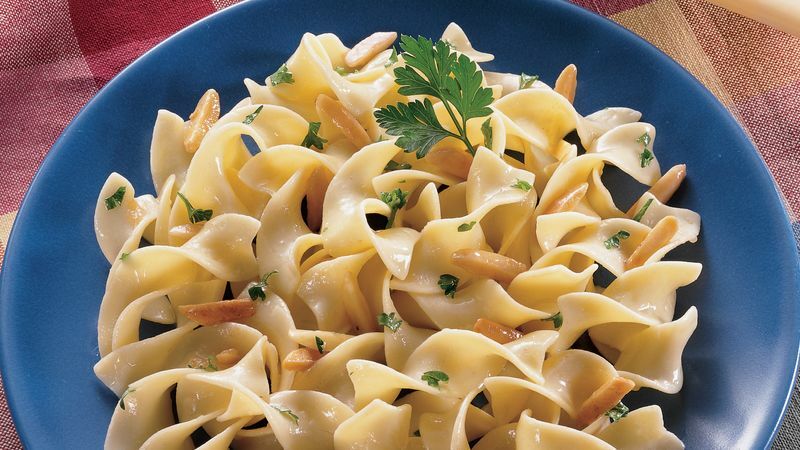 Pour browned butter and almonds over cooked noodles; toss gently to coat. Sprinkle with salt, pepper and parsley; toss to combine. Like other pasta, egg noodles become gummy if they sit too long after being cooked. Time the preparation so that you can dress the noodles with the butter-almond mixture as soon as possible after cooking.